So after a few weeks of class kit preparation and then 3 days of writing instructions for multiple kits I was READY to do something different for a change. My first thought was LEAVE the house but it has been pouring rain all week so staying inside seemed the better choice. So over to the work table...totally inspired by a few orders that came in this week (for class kits) from Ranger and May Arts (7gypsies was already "in the house"). No plan, just fun, no worry about making a kit, just stuff from the order and my stash. My kind of creating...totally organic. Start with Broken China and Peeled Paint Distress Stain. Paint a 6 x 6" piece of creme cardstock with Broken China. Can't get enough of this color! Cut a piece of cardstock 4 x 4" to use as a mask. 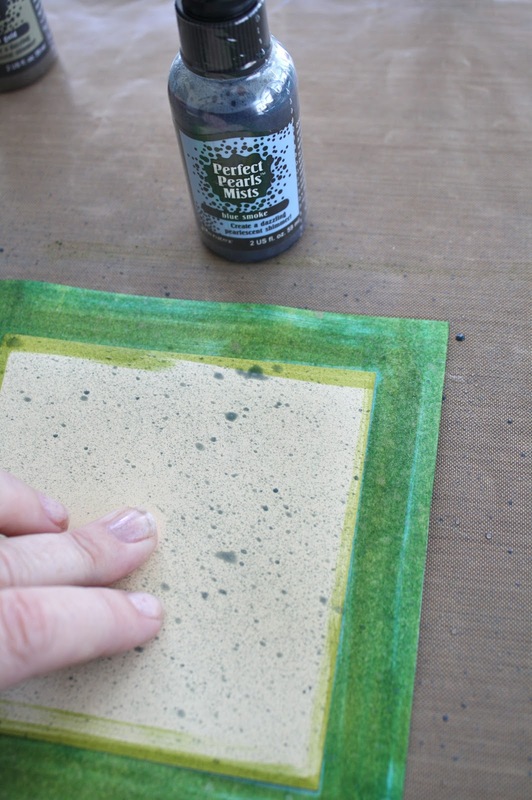 Hold the mask in place and paint on the Peeled Paint Distress Stain on the exposed surface. Again, dry the cardstock with the heat gun. Spray Entire surface with Perfect Pearls Mist - Heirloom Gold. Remember, these are mixatives so you need to shake until you hear the ball moving inside the liquid. It may look like a lot of spray here but the Perfect Pearls liquid turns to shine when the liquid is dry...just wait. Again, back to the craft sheet for a layer of Blue Smoke. This time place the mask back over the center. Hold on to the mask and spray so that the mist stays just on the green portion. Remove mask and dry with heat gun. Don't throw your mask away yet. Place the dry mask back over the center to use as a guide for a thin black line between the colors. Once you draw one time around, remove the mask and go around the square a few more times freehand. No worries if it's even, in fact it's better if it's not. Now it's time to adhere your painted cardstock to the actual book board cover. Once the cardstock is adhered to the cover, round the two right hand corners. I used this to do that on the thick book board. Once your corners are rounded, ink the edges with your favorite Distress Ink. Punch the Book Board cover with the 7gypsies Binderie Punch...super easy. I chose the word Beauty using Tim's Grungeboard Alpha. Love this package of letters because they are all different sizes and fonts...I think there is something like 230 pieces in the package. 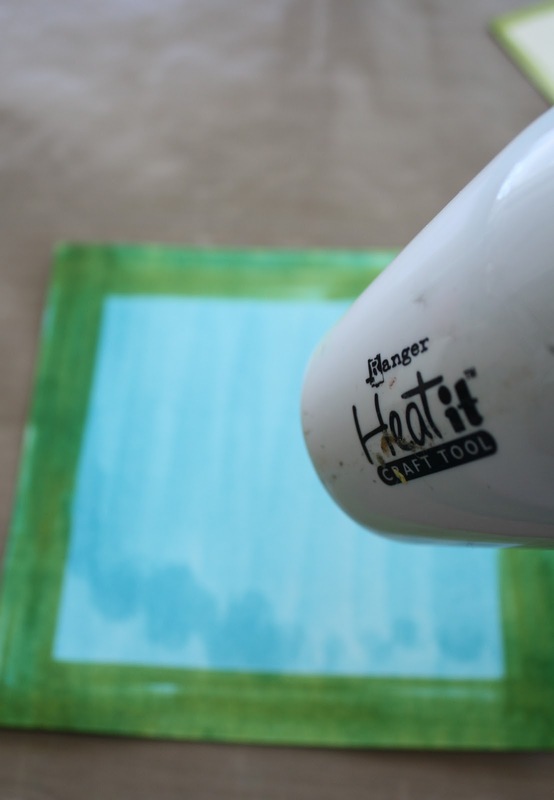 Start by coloring the letters with Dusty Concord then (of course) dry with a heat gun. Again, the stain lightens when it is dry. Once dry, go over the top with Wild Honey, dry again. Once dry, spray with Heirloom Gold Perfect Pearls Mists, dry one more time. Set letters aside while you finish the rest of the cover. Okay, so I got an order from Ranger this week which included a set of Tim's new Grid blocks. Nine thin gridded acrylic blocks. The grid is actually etched into the block itself so it's not going to wear off. Cool right? but the best part is that they are gridded so you can see exactly where a word or an image is placed. Super easy to get the word straight on the block. So here is the finished journal... I started with a background stamp from Tim Holtz/Stampers Anonymous called Going Places (love that set), then added the paper scrap and the letters. Next was the rubbings from 7gypsies and the stamp image, "Organically Grown" from my all time favorite Disclaimer clear stamp set. Then the big moth from Tim Holtz Crowded Attic Sticker set. The little ruler is from Collections Elements that I brought home from Australia last year. Love the way it looks especially at night when the whole cover shimmers in the light. I cut a matching back cover and 10 sheets of cardstock for the inside. I punched them with the Binderie Punch (you can punch about 7 at a time depending on thickness of the cardstock). Remember to round the corners of the paper to match the book. And one final touch, I added these fabulous jeweled rings from 7gypsies. So, I thought since you make it through one of my excessively long tutorials that there should be a reward at the end. So were giving away 5 bottles of Perfect Pearls Mists which includes the two used here today. Leave a comment and I'll draw a name on Thursday at noon. It's gonna be some one's Lucky Day, why not yours? paula - love all of your tutorials - i never think of them as long.. love the cover - everything about it.. would love the chance to win too! This is a fabulous project! Maybe you can answer a question for me, though: I've shied away from Perfect Pearls because they always seem to rub off my projects - what am I doing wrong? A wonderful tutorial. Thanks for showing all the new (and old) products. The juices are stirring! My guess is that you are talking about the PP powders, not the mists? If so, the final step in the process is to mist the powered area with water from a mini mister. Just a super fine spray of water. 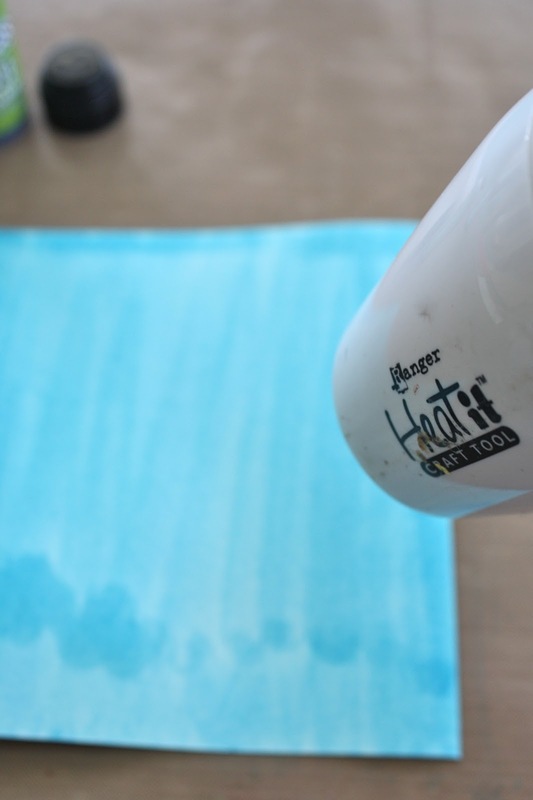 I usually dry with a heat gun after I spray but you don't have to. After the water is dry the powders should stay put. I LOVE it! What a cute idea! Can't wait for those stains to hit my LSS. They look like such fun! I love a tutorial- always find inspiration. LOVE those colors also and those jewel rings are amazing. Love the techniques you used for this. I LOVE making board books and the new Perfect Pearls Mist would be just the thing I need to give them some sparkle and shine! I just love the way you explain everything. So easy to follow. Thanks for a chance to win!!! Fabulous tutorial, as they always are. Thanks for showing us this great technique, and I love the effect that the Perfect Pearls Mists give. Such a creative and awesome project! I love how you layered the colors, and the definition it gives! What an awesome album ... totally need those perfect pearls now ...and of course it would def. be my lucky day to win !!! Hah what a great little surprise at the end of your tutorial!!!! i love the chance to win something thank you so much!!! Love the project!! It's beautiful! And the binder rings are awesome!! Those are my favorite long tutorials! The binder rings i am going to find right now. I can't wait until Friday (payday). I am ordering some distress stains and those fabulous jeweled rings. Broken China is one of my favoritedistress colors too. I use it constantly. Your tutorials are never too long! Love them! 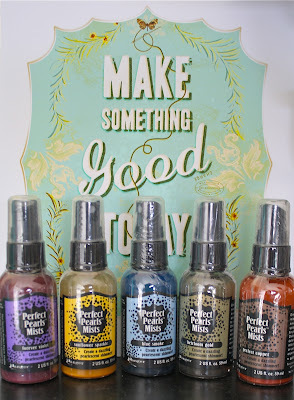 Would love to try the perfect Pearls Mists! They look awesome! Love the tutorial. I am trying to do more "artsy" stuff on some of my lo's. I love the idea of masking the middle and then doing a frame around the edge. Simple to do with a really great impact! Thanks for the tutorial and the chance to win. Have a good week. Have been waiting to try the new stains and the mists. Thanks for the info, love the look you got layering the colors. The mists really glimmer - love the jeweled binder rings! Your tutorials are never too long and I look back at them to refresh my memory often. So glad you spend time so much time at your work table! Great project. By any chance will leftover kits of MY TEN and ABUNDANCE from your classes be available? I hope. OMG I was so entranced reading every word of your process. I love how the book cover ended up looking with all the layers of colors. Great tutorial. Thank you for sharing. Happy Spring and Birds Who Sing. P.S. I would love to be entered to win these supplies. Thank You. kill me now!! does it get any better? Oooh love your art piece-and love your reward!!! Loving this project...can't wait for distress stains and perfect pearls mists to come to my little town!!! How fun to make something for the joy of it! What do you plan to put inside? Looking forward to seeing you in class soon! I got some good news today so I am ready for the luck to continue. I love all things gypsy! Gorgeous book cover! Love the colors and the shimmer. You are so creative. I seem to need a pattern to create anything! We've had lots of fun at some of those spring shows. I've never tried these before! I would love to win some! "Pick me", I cried. That is so pretty. I need to try those and spend more time creating and less time working. Nice job. Finally someone has used the distress stains in a project. They look great. Thanks for the chance to win. Gorgeous cover and great tutorial! I love how you showed all the layering you did with the different products - the results were lovely! Love Love Love your use of the Distress Stains and wow those amazing Perfect Pearl colors are awesome. Sign me up! Your tutorials are great, don't stop!! Just picked up some Stains this week (Broken China & Peeled Paint) so thanks for the great idea of layer colors. A question - How is the PP Mist different than the "homemade" mixtures w/reinker, PP & water? This tutorial just screams Spring to me! Love these Perfect Pearls. Can't wait to try them. Wow! Thank you for sharing. What a beautiful piece of art. I don't have any PP --- yet, but this has really sparked my interest. Would love to try these mists! Love your book cover! WOW. This is soooooo beautiful, I need to try these sprays. Thanks for the inspiration. I just love, love, love your tutorials...each and every one! I've been so curious about these new stains and sprays and you've helped to answer some of my questions. Thank you! How gorgeous!! Thanks for sharing! I have been thinking about trying the stains - but was afraid to - thanks for the inspiration! Great project to share with us. I haven't used the distressed stains yet. I have the regular Perfect Pearls and would love to have the mist sprays to try also. I would love for this to be my lucky day! Thanks for the chance! Coolio! Nice to see how your brain works! Please count me in for the drawing, I'd love to play with some perfect pearls. Thanks! Paula, Love the project and would love to win me some stains. Thanks for the chance. 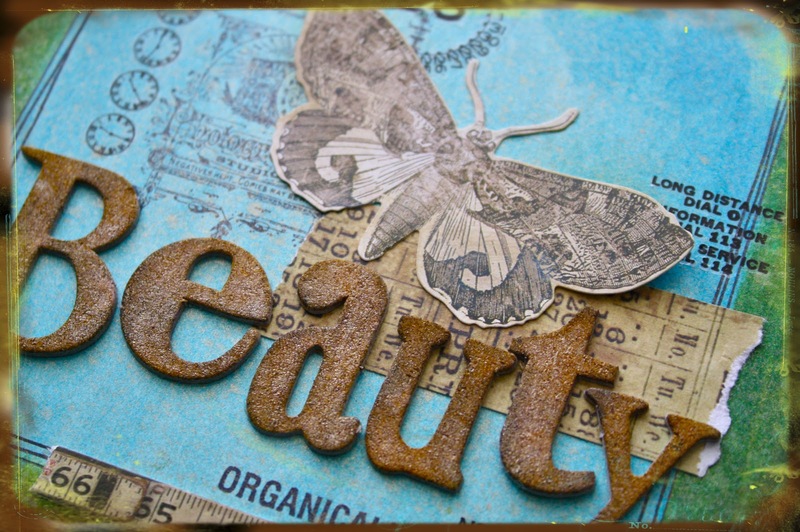 Love the inspiration you provide - beautiful! Paula, another great tutorial! So glad you share so generously. I love this step-by-step! What a cool book you made--those jeweled rings are so pretty! I appreciate the way you show how to get a vintage look with some of the more "trendy" products. I might otherwise shy away from them,but now I can see how they work with my style. Starting to LOVE this spray mists...and the shimmer is fantastic. Thanks for the opportunity to win! Another fab project...I love it!! Thanks for all the inspiration! Debbie C asked a question about the difference between the "homemade" mixture w/reinker, PP and water and these new PP mists bottles. Debbie, the difference is that in the new bottles the PP is suspended (once shaken) in a clear liquid so when sprayed, you are getting just PP shimmer not PP plus a color from the reinker. Both methods work, it's just two different effects. Totally gorgeous idea that has me itching to get my hands on these products!! I've been dying to try the perfect pearl mists. I'm still mixing my dry perfect pearls in the little spray bottles. Paula I love your project - so perfect for spring and thanks for the chance of winning the mists! what a great project! i'm thinking your tutorials are never too long - they're just right. hoping to get my hands on the stains soon! i think i'll use up some of my glimmer mist with your ideas! love the mask idea and then doodling on top? brilliant! Thanks for sharing! Love the perfect pearls mist and the jeweled rings. wow! this looks super easy. i'm looking forward to trying all the different colors of the mists. thank you for this wonderful tutorial: so inspiring! love the combination of color and that stunning rings! I always loove your beautiful projects! Thank you for the tutorial! So appreciate the inspiration and sharing your wonderful talent with everyone! Would love for it to be my lucky day!! I'm feeling lucky and creative - who know maybe I'll be the lucky one! Love the technique that you used with the stains and mists... Never tried the mists but I am intrigued! BTW - loved the long tutorial! I really could use a lucky day. I loved this tutorial and the detailed directions. I haven't gotten into much color layering but it sure is cool. I've always wanted to try the mists. Thanks for having this giveaway! I would love a lucky day-and this giveaway would make it just that. I love how you told step by step how you made this cover. I don't have these stains yet, but NOW I have to start putting them higher on my list. Thank you for sharing this with us. Great project! Your work is always fantastic. Love the broken china color, I have got to give those stains a try! Always beautiful! I'm signed up for the classes at MMU in Tucson on April 30th and can hardly contain myself till then!!! Just found your website- Love it!!! The jeweled rings are the perfect touch for this. Hi Paula, Thanks for visiting my blog and leaving a comment.Oh my that encaustic class frustrated me. I have not touched the board yet, but really want to figure out the process. 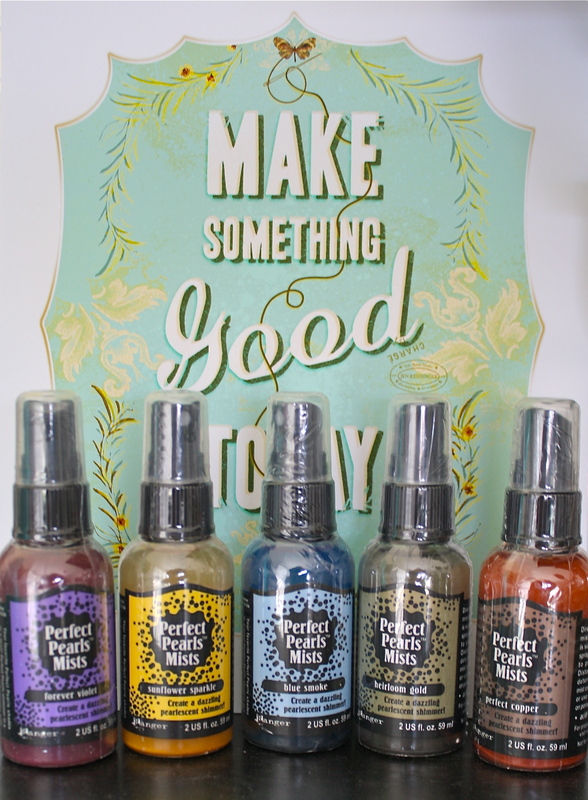 Love your cute little book here and the demo with Perfect Pearls Mists. Very cool stuff! Great tutorial! Missed out on the giveaway but I love learning something new with all of Tim's mists, inks and stains. The possibilities are endless.